Chrichton's World: Review Lethal Weapon 3 (1992): Rollercoaster ride of action and thrills. Incredibly fun! Review Lethal Weapon 3 (1992): Rollercoaster ride of action and thrills. Incredibly fun! Like Lethal Weapon 2 this part jumps right in to Murtaugh (Danny Glover) and Riggs (Mel Gibson) doing police business. They mess with a bomb they shouldn't have messed in the first place and get demoted to patrolling in uniform. Like that would stop them from getting into trouble. More than ever Murtaugh is psyched to retire. He is counting the days and certainly doesn't want to deal with excitement or danger of any kind. Riggs on the other hand can't stop policing and stumbles on a case that ultimately will result in mayhem and chaos of the highest order. And I mean the highest order. 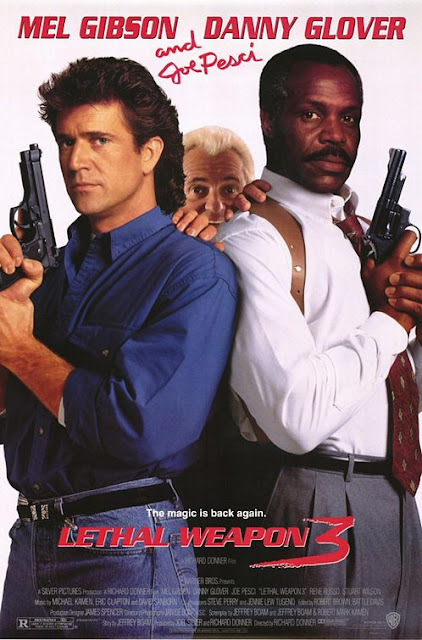 Lethal Weapon 3 is incredibly fast paced and action packed. There are barely slow moments in this part and the few that are provide comedic relief or have dramatic impact. Like it's predecessors there is not really that much of a plot but more than enough character development and crazy antics to keep this fan happy. At this point Murtaugh and Riggs are family and have more friends and relatives coming their way. One of them is Lorna Cole played by Rene Russo. She is like the female equivalent of Riggs and is the first to best Riggs without effort. Leo Getz (Joe Pesci) returns and he also has become part of the gang although he still gets subjected to relentless teasing. Just leave him alone already. He saved Riggs from getting killed and how do they thank him? By writing torturous medical exams on his chart so that he won't follow and nag them. Stuart Wilson as Jack Travis is the main villain of the story who is a little different compared to previous villains because of his past profession. He probably is the most dangerous yet by delivering the most lethal guns and ammo on the streets. One of the direct consequences of this action is an event that deeply affects Murtaugh who already was worried beyond belief. Actually come to think of it, when is he not worried? He does seem to be a little more laid back and loose in general so that is fun to watch. Now this plot doesn't exactly fit in tonally since for the most Lethal Weapon 3 is very light hearted. But somehow it is exactly what you would expect from this film series so is not something that is bothersome or annoying. I have seen Lethal Weapon 3 many times and it was just a blast as the first time I watched it. Maybe even more now since this is offering the kind of old school action that is rarely done these days. So for me this is a classic and a must own for sure.